Another boating season is underway, and last weekend we made our first trip of the season out of our marina. The weather has been fluctuating somewhat, since we're still so early in the season. There has been a fair amount of rain and cold temperatures, which have kept us sitting at the dock. But the long weekend was shaping up to have some great weather, so it was time to head out. Last summer was our first in the area, and we were somewhat limited in our free time, so we only able to explore a few areas fairly close to Kingston. But in that time, we did find some favourite anchorages within a short distance. One of those is Beaurivage. Beaurivage is one of the first members of the Thousand Island chain that we hit from Kingston. We are very fortunate to be sitting at the start of the Thousand Islands, an incredibly scenic area of the lake, right where Lake Ontario empties in the St Lawrence. It only takes us about three hours to reach this anchorage. On Saturday, we were lucky to be joined by three friends from Ottawa. We started the day by meeting them in Gananoque, where they left their car. We drove out to meet them, brought them back to Kingston, and set out mid-morning. Unfortunately, the wind wasn't cooperating. In fact, it was non-existant. So the trip was a motor trip instead of a sail, but even when we are forced to burn some fuel, this is still a great trip. From our berth in Collins Bay, we passed by the city of Kingston, and pulled into Deadman's Bay, under the cannons of Fort Henry. We anchored for a couple of hours for lunch, then continued on. 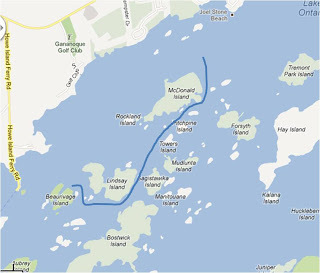 The Bateau Channel runs between the mainland and Howe Island. Passing between the land masses is more scenic than the main channel, with only small boats using this passage. At the end of Howe Island, suddenly you are in the midst of the small islands of the Thousand Island, with the first little taste of why this is such a popular cruising ground. Beaurivage Island is right in front of you when you come out of this channel, with the anchorage around the back side of the Island. But before anchoring, first we continued on the Gananoque to drop off our friends, so we took the Wanderers Channel. This picks its way between many of the small islands in the area. When we first arrived here, we stuck to the larger channels, until we realized that even the large tour boats were passing through this area. We've made this passage quite a few times now, but the first few times were quite uncomfortable. In places, you're passing midway between the islands, with about a boat length on each side. You can see the rocky ledges coming off the shore of the Islands, but by sticking to the middle of the channel, there is plenty of depth. Very different from Prince Edward Island, where every land mass has a protruding sand bar, and it's almost impossible to get anywhere close to shore. On the other hand, running aground in PEI is a soft landing. Here, it is solid rock. This area really gives a great taste of the Thousand Islands. The islands here are fairly small, no more than a few hundred feet in length. Most of the islands are home to cottages. These cottages are, almost without exception, quite nice. On some of the smaller islands, it seems the cottage covers the entire available space. After dropping off our friends, we went back to Beaurivage. This is a very popular anchorage, and you often have to pick your way between boats to find a spot. However, this early in the season, there were only a couple of other boats. Our intention was to stay here for night then move on to another spot. But, as so happens here, we spent Sunday lying around and reading, having a very relaxing day. On Monday, we pulled up anchor, and as the winds still hadn't reappeared, motored our way back to Collins Bay. Obsession 305 found a new owner. Selling a sailboat is rarely a short process. Unless you are either lucky, or are willing to sell for well below market value, you cannot bank on a quick sale. There is a ilmited market for sailboats, particularly in Atlantic Canada. We knew this when we decided to make the decision two years ago to upgrade to My Obsession, but it's still a relief to finally have a sale. For the past two seasons, we've still been taking care of our old boat, mainly by making sure she was stored indoors for the winter. That meant bringing it out and towing it to our yard for the summer. Since it was stored in an old barn, and then kept outdoors for the summer, it would tend to collect some dust and dirt. So each fall, we would give her a cleaning, make sure that the batteries were charged up, then haul it about 15 km back into storage. About three weeks ago we had a call from our broker that there was someone interested, and they wanted to see the boat. She was still in winter storage, so he came over from Newfoundland to see Obsession 305. Obviously he liked what he saw, since he sent us an offer a couple of days later. We quickly came to an agreement. A few days later, the marine survey was conducted, and there were no problems. When it was evident that the deal was going through, I flew home from Kingston. We had the boat taken out of winter storage, and we lifted the mast on top of the boat and secured it for transport. The next day, the new owner arrived from Newfoundland, hooked up to the trailer, and they were off. 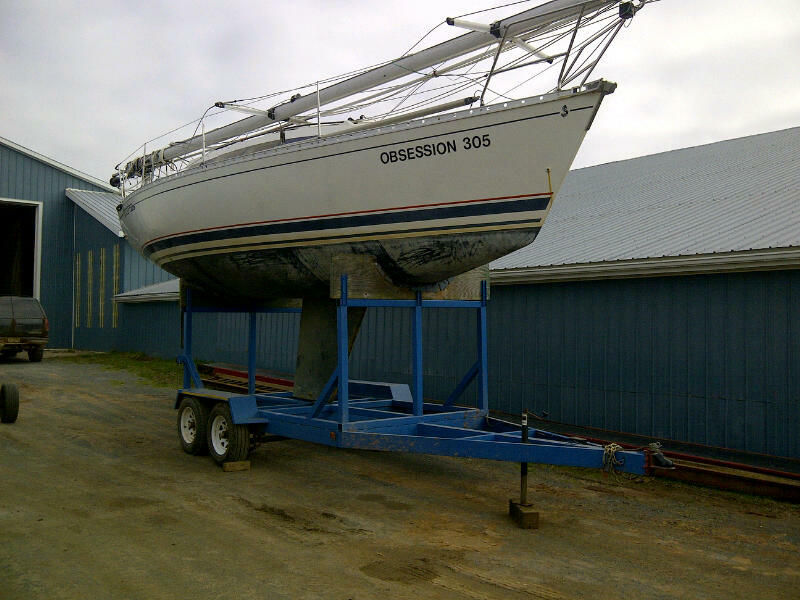 We had a few years of great sailing memories on Obsession 305. She was a great boat for us, and a perfect boat to introduce us to the cruising lifestlye. We put many miles under her keel, touring around the Maritimes, vising many familiar places in an entirely new way. It was with Obsession 305 that we built memories of traversing St Peters Canal, which I had crossed so many times growing up. It was how we first passed under the Confederation Bridge, instead of driving over it. It was how we explored the coastline of PEI, Nova Scotia and New Brunswick at an entirely different pace than touring by car. Obsession 305 brought us to may towns and villages, which we explored on foot. It was with Obsession 305 that we decided to make sailing such an integral part of our life, and figured out what boat we needed. Although it was a lot of great memories heading down the road, after waiting for two years, it was still a relief to see her go. We're very happy with My Obsession, which has greatly expanded our range and ability to stay aboard. Obsession 305 was how we figured out what we wanted in a boat, which we found in My Obsession. We just hope that her new owner builds more great memories with Obsession 305.